If you want to add a chat room to your subreddit, Gliph Chat Channels are a quick and easy way to do that. Gliph has been chosen by popular subreddits over many other chat solutions because it has solid apps for iPhone, Android and a great desktop client. 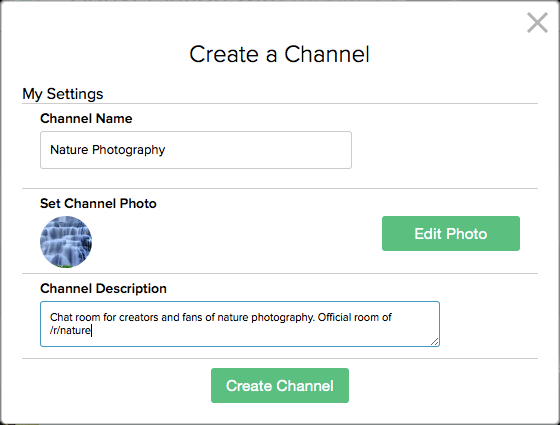 Gliph chat channels offer user privacy and can be customized to your theme. Share the invitation link with a friend so you know everything is good. * [Triathlon Chat]([YourChannelInviteLInk]) – Chat with other Triathletes from this Subreddit from your computer or smartphone. Step 3. Submit a new link to your subreddit alerting people to your new chat channel. We’re here to help! Send an email to support@gli.ph or ‘support’ on Gliph and we’ll help you get going! 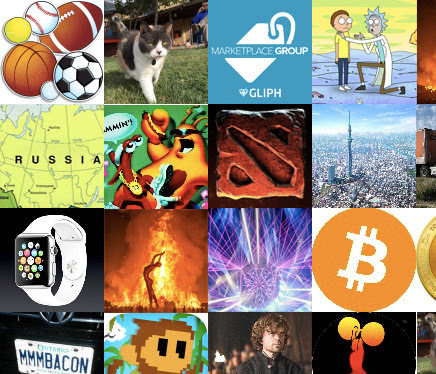 This entry was posted in Gliph Community, Gliph Messaging, Gliph Web App and tagged reddit, subreddit on March 30, 2015 by rob. Gliph is transitioning away from its Legacy username (symbol-based) to a new alphanumeric Gliph username system. You may now identify yourself on Gliph with a unique username made up of letters and numbers. This new username may be set by signing in and editing your account profile on the Gliph iPhone, Android and web applications. You can use your new Gliph username to be found on Gliph via username search or by accessing a Profile Page webpage. Gliph Profile Pages are a new feature on Gliph and covered in this blog entry. Gliph is committed to providing a private communication experience. If you already have a Gliph account and a Gliph Legacy username, you may continue to use Gliph without choosing a new Gliph username. If you do not pick a Gliph username, you will not be found using the username search function and you will not have a Profile Page webpage. If you do pick a Gliph username, your public Facet information will be available on your Profile Page. To ensure you’re sharing what you want, we recommend you review your Profile and privacy settings on your personal information before setting your username. Gliph usernames may be anywhere between 3 and 16 characters long. They may contain letters, numbers and the underscore character. Usernames are first-come, first serve and are may only be used once. Once selected, you can not change your username. Your new Gliph username will automatically set your your Profile Page URL to https://gli.ph/[username]. Gliph usernames are not case-sensitive at entry, but they will display the CaSe Style YoU choose. Shorter usernames will be easier to remember and share with friends or associates. Gliph is a burgeoning community that relies on trust. Please do not choose usernames intended to deceive, intimidate or threaten other people. As regular users of Gliph ourselves, we have found the Gliph Legacy usernames have not become easier to use over time. Though stylistically unique, Gliph Legacy usernames got in the way of the experience in a few ways. First, people from the Gliph community told us they like the service but find it too hard to connect with other people. A basic function is being able to look up another person in the system and the symbols added friction to that process. Sometimes when the symbol-usernames were shown in a public group conversation, it was challenging to track who was who. An emerging problem with Gliph Legacy usernames is that they don’t store well in password management tools like 1Password. The symbol-based usernames were a daring and interesting way to stand out for a company championing privacy and security before people were paying attention to these things. Privacy and security are still top priorities with us, but Gliph is bigger than those two things. Gliph now helps people connect and transact with each other using Bitcoin. We want the focus here, not on a novel username system. Moving to alphanumeric usernames simplifies the Gliph platform without sacrificing pseudonymity. You don’t have to remember the symbols that your friend chose or find them on our symbol keyboard. You just need to know their unique written username and type it in. All existing Legacy Gliph usernames will still be supported. You will still be able to search for them and create a 1-on-1 connection or to add them to Group. However, the default search will be to the new alphanumeric Gliph username system. We want to thank everyone who customized their Gliph Legacy username and those who took the time to explain the system to other people. When we shared this change with friends and family in the Gliph community, there was a combined expression of sadness and also relief. Many of Gliph’s biggest fans memorized and cherished their Legacy username. Some of Gliph’s initial backers took particular interest in the uniqueness of our Legacy username system. Sadness quickly became nostalgic, though, as folks acknowledged a simpler username system would be to the benefit of all Gliph users in time. What we lose from leaving behind Gliph Legacy usernames, our team will work to add practical, useful and fun features to take their place. This entry was posted in Gliph Messaging, Gliph Platform, Profiles, User Experience on September 25, 2014 by rob. To help ensure you have a great experience on Gliph, we’ve now made it possible to block and unblock other Gliph users. If you receive unwanted contact on Gliph, this new option allows you to remove your connection with them and prevent a new connection from being created. This means your existing conversation with the opposing user will be permanently deleted and you will no longer receive notification of direct messages from them. You also will not be able to send direct messages to them. Blocking someone is pretty easy, and can be done using Gliph’s web application. Start by logging in to the Gliph mobile or desktop app. Then visit the profile page of the person you want to block. You can access someone’s profile page by clicking or tapping on their Profile Photo in any conversation. Blocking another Gliph user will not silence them if you are both in the same Group conversation. If someone is giving you grief in a group conversation, we recommend the group admin set the group to Closed and kick the user from the group. This will prevent them from re-joining. Gliph’s Terms of Service already do not allow harassment of other users. However, we realize people may want immediate and direct resolution to unwanted communication. This new feature is our first step toward providing this. This entry was posted in Gliph Messaging, Privacy, User Experience on September 25, 2014 by rob. Today we’re releasing secure group messaging for Gliph! We’re excited about this release for two reasons: Gliph users have been requesting group messaging and because group messaging is our first release to leverage the powerful improvements we made recently to the Gliph platform. There are many group messaging apps to choose from, so what makes group messaging on Gliph unique? Strong Identity Controls – Leverage Gliph’s unique privacy capabilities to show your real name to one group on Gliph, and a pseudonym to another. Data impermanence / Deletion – Erase history by deleting any of your messages permanently from a group conversation, removing it for all group members. Protection from Group Snooping – Keep your conversations completely private to you and your group members using Closed Groups in combination with Lockdown Privacy Protection. Cross-Platform – Include Android, iOS, and web users in your group conversations. Access the discussion from your mobile, tablet or desktop computer. Group Notification Preferences – Choose whether to get notifications from any given group. Group Invitation Links – Open groups have single links that allow people new to Gliph to sign up and automatically join your group. These features also come with new System Messages, which helps show when someone has been invited to or removed from the group. Group messaging has been requested by Gliph users for a long time, so we’re very pleased to bring it to market on all of Gliph’s clients. Enjoy! This entry was posted in Consumer Security, Gliph Messaging on July 21, 2014 by rob. The team is pleased to announce the release of GliphMe! GliphMe is a powerful little chat system that can replace email and SMS texting. It can save you time and be used to increase your privacy online. GliphMe lets you create a web link that anyone can use to start chatting with you on your iPhone or Android. When someone clicks one of your links and sends you a message, you will be notified by the Gliph app. You can reply immediately wherever you are from your mobile device. Gliphme is useful in a variety of cases online, and you can learn more at GliphMe’s explanation page. 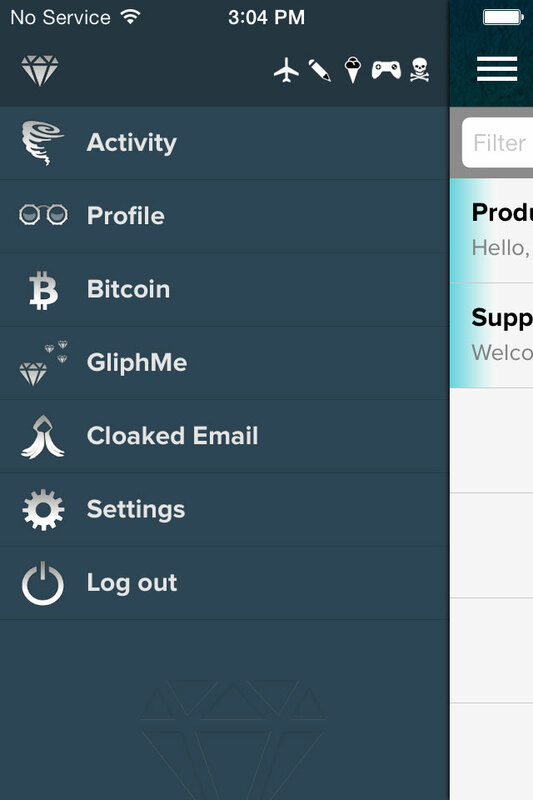 Here’s how it works: You start by creating a new GliphMe link using the menu in the Gliph iPhone, Android or web app. GliphMe appears just below the Bitcoin option. This entry was posted in Craigslist, Email, Gliph Messaging, GliphMe, Phone Numbers, Privacy, User Experience on January 23, 2014 by rob.